The degree to which a new barrel is toasted and/or charred can have a huge effect on a whiskey's flavor. 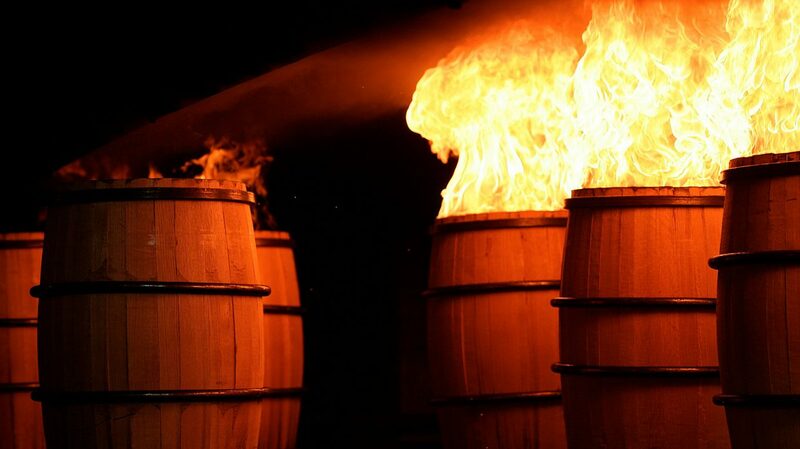 Brown-Forman Cooperage (pictured) makes hundreds of thousands of barrels a year. 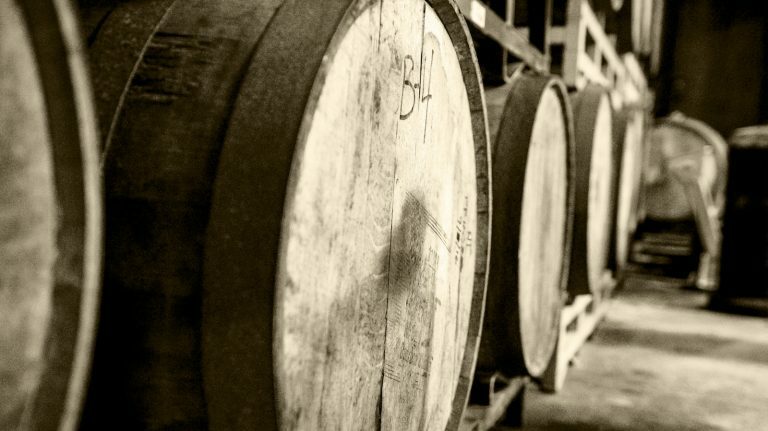 Bourbon whiskey—and rye, wheat, malt, and Tennessee whiskey—must be aged in new, charred oak barrels. 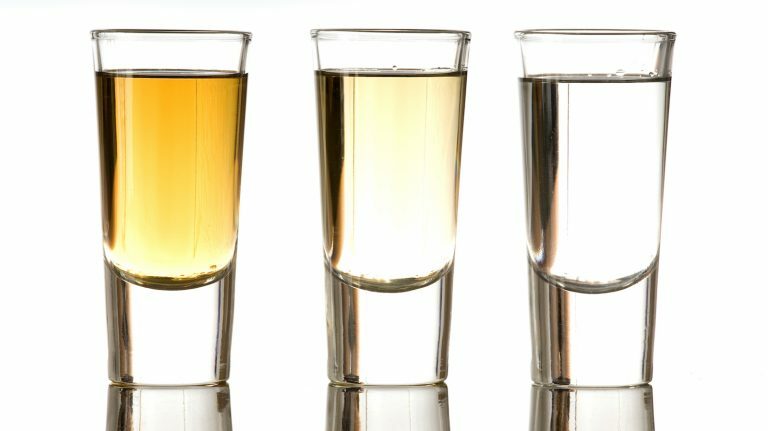 Within that requirement, however, there are myriad variations that can affect the color, aroma, flavor, and mouthfeel of the final whiskey. 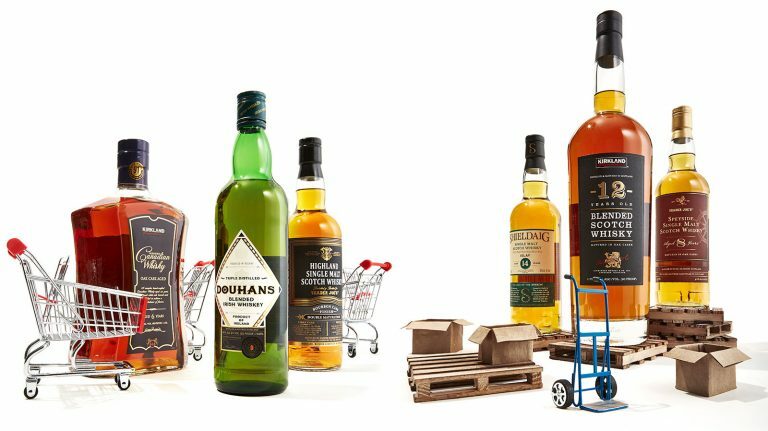 Working within those barrel specifications allows distillers to craft a distinctive product, with decisions about char and toast level having major ramifications on the final whiskey. Wood terroir is one variable. While more or less all barrels are made of white oak, the wood itself can vary by region. In colder northern climates, for example, trees grow more slowly and have a tighter grain. The flavors they offer are more concentrated, but also harder to reach and absorb. After the wood is harvested it must be dried, or seasoned, since more than half its weight is water. Kilning—drying the wood in a heated chamber—is the fastest and easiest way, but not the best. The wood will be dry enough to make barrels, but that’s about it. With natural seasoning, rough-cut staves and headpieces are stacked up outdoors and left alone for six to 24 months (occasionally longer). They are rained and snowed on, baked in the sun, frozen, thawed, and invaded by microbes. This process reduces tannin levels and breaks down various compounds, which are then available for incorporation into the whiskey as it matures. Natural seasoning allows the wood to begin decomposition, which is good. Fungi send out roots (hyphae) that penetrate into the wood structure and release hydrogen peroxide, a natural bleaching and oxidizing agent that helps break the wood down chemically, softening tannins and caramelizing hemicellulose (a complex carbohydrate found in plant cells), among other salutary effects. Kilning does none of that. After the wood has been seasoned, it gets fashioned into a barrel. But before it can be used to hold whiskey, it must be charred. How long the barrel burns—from just a few seconds to a minute or more—determines char depth. The charred wood acts as a filter, changing or eliminating various congeners in the distillate. Congeners are substances produced during fermentation, other than ethanol, that give whiskey much of its taste and aroma. But there are good congeners and bad congeners. Some of the bad congeners are eliminated during distillation; the charred barrel takes care of the rest. Toasting is another way of treating wood, though it is less common. Incidental toasting occurs during the charring process, as heat converts hemicellulose into sugar and creates a toasted layer below the char level. That incidental toast is limited, however, because a barrel can only be burned for so long before it starts to lose structural integrity. It is possible to toast barrels more deeply before charring, but because it is an extra step that adds cost, most distillers don’t do it. Some, however, do, as pre-char toasting releases more sugars that can be extracted during the maturation process. Variations in toast time and temperature, as well as in char level, create different flavor profiles. Danville, Kentucky’s Wilderness Trail Distillery uses barrels that mainly come from Independent Stave Company (ISC). “A barrel will give up around two pounds of sugar over a five-year maturation,” says co-owner Shane Baker. “We selected one of the different ranges of toast ISC offered that showed elevated caramels, chocolates, and vanillas. 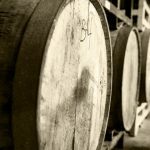 Toasting gives us more access to those sugars earlier in the aging process.” The wood for Wilderness Trail’s 53-gallon barrels is naturally seasoned for 18 to 24 months. Then the barrel gets a 43-minute toast and a #4 char (the deepest level in general use, resulting from a 60-second burn). Woodford Reserve uses two types, a standard barrel and a finishing barrel that was created exclusively for its Double Oaked bourbon. The wood is seasoned naturally for nine months, and each barrel receives a pre-char toast to degrade the oak’s lignin (a polymer found in plant cells) into its three chemical components: synapealdehyde, syringealdehyde, and vanillin, which imparts characteristic vanilla flavors. The toast takes about ten minutes, and then the barrel is charred. Some Brown-Forman barrels burn for as long as a minute, but the standard Woodford char is just 25 seconds. “This provides the right amount of sweet aromatics without giving up the desired vanilla character,” says Morris. The Double Oaked finishing barrel, however, receives a brief 5-second char. 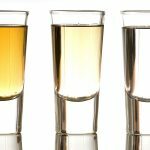 Many distilleries will tell you their barrel specifications, so you can taste-test to see if you can detect a difference. Most use the heaviest char but a few, such as Woodford Reserve and Maker’s Mark, use something a little lighter. There are some whiskeys that use toasted, un-charred barrels for aging, such as Old Potrero 18th-century style whiskey, which is made from a rye mash. (It cannot be called rye whiskey because the barrels are not charred.) Michter’s released a whiskey finished in toasted barrels, and Blood Oath Pact No. 4 is a blend of bourbons, including one finished in toasted barrels. 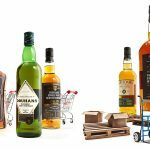 Using toasted barrels may not be a widespread phenomenon, but the flavors gained through the process offer yet another distinct variation on a familiar whiskey.